The coastal successions of Newfoundland, Canada, contain some of the oldest examples of the Ediacaran biota. Dated to between 570 and ~560 million years in age, rocks of the Conception and St. John's groups possess thousands of fossils, largely preserved beneath volcanic tuffs, recording successive 'snapshots' of Ediacaran seafloor communities. Newfoundland's fossil communities are reasonably diverse, and are dominated by frond-like fossils termed rangeomorphs. The biological affinities of the rangeomorphs remain to be determined, but they appear to have lived in deep-marine environments. In addition to possessing some of the earliest macro-fossils on the planet, Newfoundland can also claim some of the most important trace fossils, which provide evidence for the presence of animals in these ancient ecosystems. The Global Stratotype Section and Point for the base of the Cambrian System - the "official" location that defines the boundary between the Ediacaran and Cambrian Periods - is located on the Burin Peninsula of Newfoundland, and is marked by the first appearance of the complex trace fossil Treptichnus pedum (Brasier et al., 1984). In addition to this, some of the oldest trace fossils thought to have been produced by animals can be found in rocks of ~565 million years in age at Mistaken Point (Liu et al., 2010). These traces were made by an organism 'shuffling' across the ancient seafloor, in a manner similar to modern sea anemones. 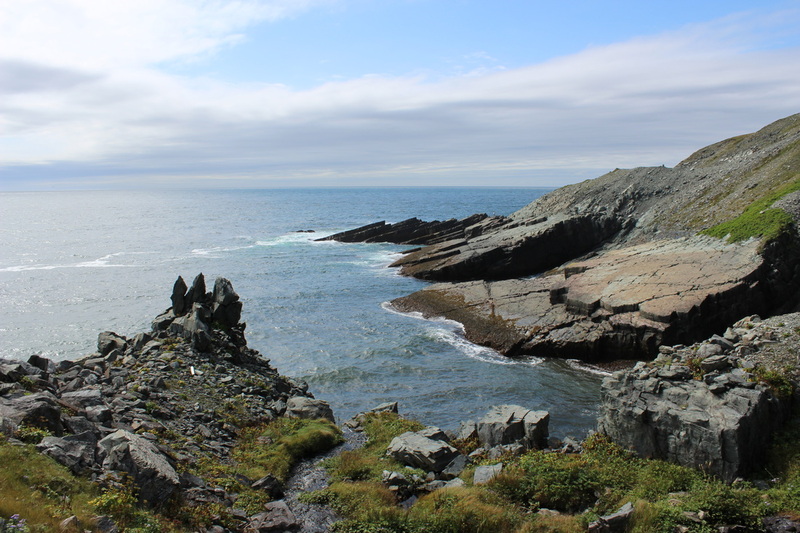 Ediacaran macrofossils have been described from several places in Newfoundland, but the two key localities are the Mistaken Point Ecological Reserve on the southeastern coast, and the Catalina Dome on the Bonavista Peninsula (described further below). 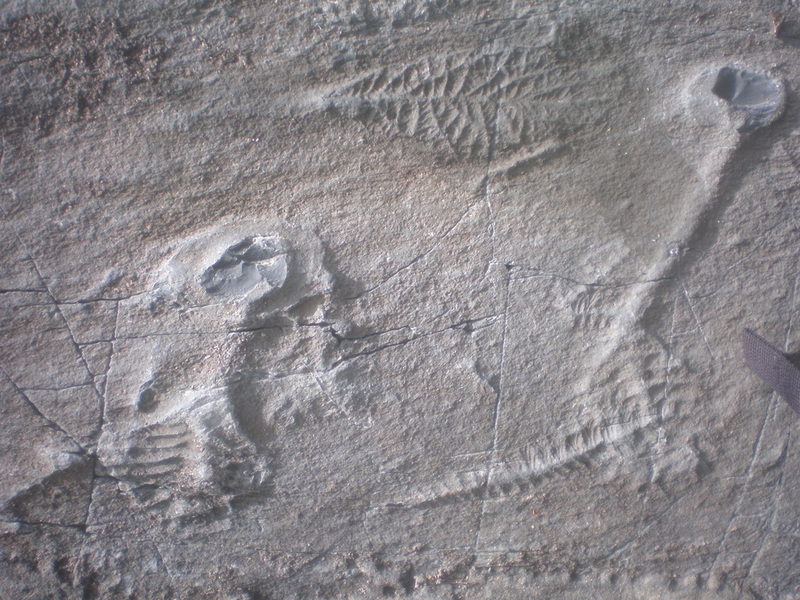 Additional key localities include Ferryland, where 1000s of discoidal fossils are preserved (Gehling et al., 2000), and Spaniard's Bay, where one bedding plane in particular reveals spectacular preservation of juvenile rangeomorphs that are remarkably three-dimensional in their appearance (Narbonne, 2004). 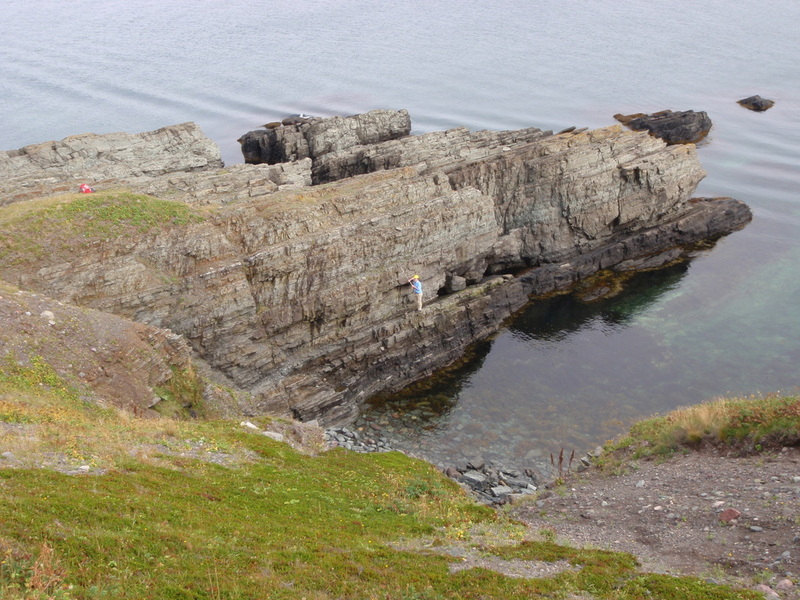 The Ediacaran - Cambrian GSSP section at Fortune Head, Newfoundland. Jack Matthews for scale, pointing to the level of the boundary. Mistaken Point Ecological Reserve (MPER) lies on the southern coast of the Avalon Peninsula, Newfoundland, adjacent to the town of Portugal Cove South. Since the initial discovery of fossils here in 1967, this site has become one of the most iconic and scientifically valuable palaeontological localities on the planet, and was inscribed as a UNESCO World Heritage Site in July 2016. Two particular bedding planes, the 'D' and 'E' Surfaces, each contain 1000s of exceptionally preserved fossils, and have been responsible for much of the scientific information we have about Ediacaran organisms from Newfoundland. At Mistaken Point, numerous large bedding planes are naturally exposed along the coast, often dipping dramatically towards the sea. The Ecological Reserve covers 5.7 km. sq., and access to the fossil sites is controlled by a permit system and a guide-based tourist operation. The site lies within the geographically restricted Eastern Hyper-oceanic Barrens Eco-region, and is also known for its birdlife. The rocks at MPER span the upper Drook (Conception Group) to lower Fermeuse (St John’s Group) Formations, recording a largely deep-marine axial basin and slope depositional setting, deposited in the vicinity of a volcanic island arc (e.g., Wood et al., 2003). Radiometric dates at the site constrain the fossil assemblages to 570–560 Ma, with fossil-bearing surfaces dated at ~570 Ma in the Drook Formation, and to 565 Ma in the upper Mistaken Point Formation (Pu et al., 2016). The succession spans around 2000 m of siliciclastic stratigraphy, almost all of which is visible and accessible to study. A glacial deposit, the Gaskiers Formation, lies beneath the Drook Formation, and documents a major glaciation around 580 Ma (Pu et al., 2016). However, the global extent of this event remains to be determined. This site contains the oldest known macroscopic Ediacaran ‘animal’ fossils, with 1000s of specimens preserved on over 100 coastal bedding planes. Fossils here provide some of the best-preserved and largest examples of the Ediacara-type biota, and are unusual for also recording early life within a deep-marine depositional setting (cf. Wood et al. 2003). Important studies into palaeoecology (Clapham et al. 2003), metabolism (Laflamme et al., 2009), ontogeny (Liu et al. 2012), and taphonomy (Liu, 2016) have been conducted at this site. It also contains the earliest known evidence for metazoan locomotion (Liu et al. 2010), and in situ type specimens of multiple species (e.g., Beothukis mistakensis, Pectinifrons abyssalis, Hapsidophyllas flexibilis). MPER has attracted the attention of several documentary film-makers and authors (e.g., the David Attenborough series First Life, 2010). It is one of very few places in the world where natural exposures of so many fossil-bearing bedding planes can be studied in one place. The Catalina Dome is a broad anticline, roughly 8 km by 7 km in maximum dimension, centred on the town of Catalina, on the Bonavista Peninsula, Newfoundland, eastern Canada. Almost all fossil exposures lie on the coast, with locations varying from accessible but remote walking trails, to flat bedding planes in the harbours of the settlements of Port Union and Little Catalina. Fossils here are protected by Palaeontological Regulation 67/11, under the Newfoundland and Labrador Historic Resources Act. The anticline on which the Catalina Dome site is centred consists of rocks of the Drook Fm. (Conception Group) through to the Renews Head Fm. (St John’s Group), all of which are siliciclastic units. They record a broadly shallowing upwards succession of deep-marine and slope deposits, over a stratigraphic thickness of ~ 700 m (Hofmann et al., 2008; the stratigraphy continues into the Renews Head Fm. to the North). No radiometric dates have yet been published from this region, but it is correlated with the Avalon Peninsula on the basis of litho- and biostratigraphic similarities (Hofmann et al. 2008), and therefore is considered to have an age of ~570–560 Ma. The Catalina Dome contains fossil assemblages and fossil abundances that compare closely to those of the Mistaken Point Ecological Reserve to the south, and the site has already aided research into the enigmatic Ediacaran organisms of Avalonia. Individual bedding planes can preserve spectacular fossil specimens (Liu et al., 2016), but as fossils were only discovered in the area in the early 2000s (O’Brien & King 2004), there remains plenty of potential for further discoveries. The main publication on this region (Hofmann et al., 2008) described four new taxa and presented one of the first detailed descriptions of biostratigraphic ranges within Ediacaran macrofossil assemblages.